A film tour sounds so grand and famous. It might be for Jake Gyllenhaal or Jennifer Lawrence with stops on Letterman, screenings in Cannes, and first-class seats in between. An independent documentary film tour is quite different. Earlier in 2014 I made a film with my brother and a buddy about a month-long canoe adventure down three rivers embroiled in a battle over water rights in Georgia, Florida, and Alabama. We’ve been lucky to have the film selected by a handful of festivals and screened across the country. And we even made a cameo on The Weather Channel to talk about our film for two minutes on a recent Tuesday afternoon in Atlanta (pictured in studio here). But the most important place to share the film and its story of water conservation is in the towns that use the river. So I spent a few weeks in October driving a rental sedan between small towns in Georgia and Alabama. In Albany, GA’s Flint RiverQuarium I met a retired couple who’d come to see the film on their “date night.” The gentleman told me he used to canoe down the Flint 60 years ago as a teen, and they’d camp on the banks where natural springs bubble to the surface. He said they’d wrap their caught fish in sweet gum leaves, then cake it in fine clay dug out from the spring’s mouth, then cook it in a fire pit. When it came out the hardened clay needed to be cracked to get at the flaky white meat. Another local man came to a screening and invited me to visit him at his riverside home. 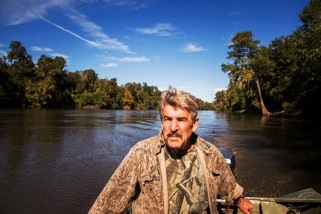 Vic Miller is a writer, a retired English professor and, as he says, “a ne’er do-weller.” When I arrived at his house at 9:30 am on a Friday morning, Vic was dressed in camo, packing a dirty old aluminum fishing boat for an overnight trip down the river. He needed to go to the “grocery store,” meaning the riverbank woods to kill a deer or hog. I rode down the river with Vic for a bit that morning and we pulled in under hardwood trees just beginning to shake their leaves in the early fall. The clear water of Radium Springs entered the chocolate-milk brown of the Flint River and Vic eased the boat onto the slippery clay banks. We got out and walked up to an old stone bridge. 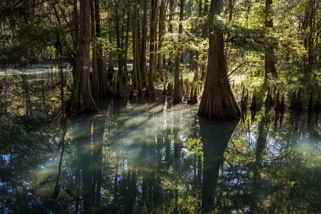 Radium Springs’ inky teal and algae-green water spread under the umbrella-canopy of oak and cypress trees. Vic leaned against the trunk of an oak and told me about growing up with these springs in his backyard. He called this “the center of everyone’s childhood,” where they’d spend summer afternoons and evenings immersed in the underground cool water while the heavy air hummed with biting flies, no-see-ums, and humidity. Vic came to this place as a young man when the hallucinations from his Korean “military fellowship” wouldn’t let him sleep. Late one night he came to this stone bridge, the safest place he knew, and he let these healing waters ease his mind. The hallucinations never returned. So the film tour rambled on, from Albany to Americus to Warm Springs, GA then across the border to Auburn, AL, up to Athens, GA, and ended in Atlanta. Whether the crowds were fifteen or three-hundred, it felt good to celebrate these rivers that have a deep, unheralded connection to so many people in Georgia, Alabama, and Florida. And it felt good to stand there before and after the films and participate in that ancient barter of story sharing.